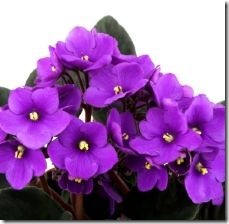 Some think African violets are easy to grow, while others believe they are among the most finicky of houseplants. Whatever your opinion, the deep velvety flowers of pink, white and shades of purple have earned them a place them among America’s most popular houseplants. You can find African violet pots, African violet soil and African violet fertilizer to simplify the care of these plants, but to reach their potential size of more than a foot across, they require close, frequent attention. Mind the African violet’s persnickety temperament. When it comes to growing conditions, African violets are more particular than most plants. The good news is that they “speak” to you. They let you know immediately when they’re not happy—their leaves droop, and they respond to improved conditions very quickly. Make sure they have enough light. African violets bloom most prolifically in an east- or west-facing window or under a fluorescent light. Water regularly. This is the tricky part. African violets require frequent, thorough watering so that the soil is always moist, but never allow the plant to sit in water or you’ll create a nasty case of root rot. If the top of the soil is dry, the plant needs water. Watering from the bottom is safest, as the flowers and foliage should remain dry. One solution is to place the plant‘s pot in a saucer of room temperature water. When the water is absorbed, refill the saucer. If water remains in the saucer after 15 minutes, remove the plant and put it in the sink to allow it to drain. 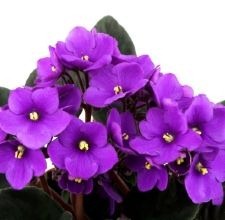 Fertilize the plant every 2 to 4 weeks using a commercial African violet fertilizer. Maintain an optimal temperature. African violets flourish at 72 degrees F, but can tolerate temps as low as 62 degrees F for short periods. Deadhead, or pluck the blooms from the plant, when the flowers wilt. Do your best not to touch the other blooms or leaves when you deadhead, as they may become discolored or droopy.